You can find bottles of hand sanitizer just about everywhere these days, and people tend to rely on them, especially at school where kids tend to spread germs around the classroom. But the ingredients in the average hand sanitizer are highly toxic, not only to germs, but to you. Hand sanitizers may affect your immune system by killing good bacteria which keep disease-causing bacteria at bay. A 2011 study by the Centers for Disease Control found that healthcare workers who routinely used hand sanitizers increased their risk of developing norovirus (“stomach flu”) by almost 600 percent! Given the mounting evidence that healthy microbiome is key to preventing mental illness, diabetes, obesity and autoimmune disease, anything that destroys good bacteria should be strenuously avoided! Triclosan, which degrades to dioxins in the body, is proving to be highly toxic. A 2014 study by the American Chemical Society found that triclosan spurred the growth of breast cancer cells, and studies at the University of California at Davis found it can kill brain cells and impair muscle function. Numerous additional studies have found it interferes with hormones. If that weren’t bad enough, the Food and Drug Administration says that triclosan may cause bacteria to adapt to its antimicrobial properties, creating more antibiotic-resistant strains, or “superbugs.” Additional research shows that people with high levels of triclosan in their noses (from touching their noses after using hand sanitizer) were twice as likely to carry disease-causing Staph bacteria in the nose. Triclosan also gets into waterways, where it can harm aquatic life. Recent studies have found that the chemical caused “dramatic” algae die-offs and altered the natural composition of bacteria in streams—a potential problem for higher species, including fish, frogs and salamanders. Personal care products like hand sanitizer often contain chemicals called parabens that prevent the growth of bacteria. Parabens have been linked to cancer, neurotoxicity, endocrine disruptions, and skin irritation. Ingredients to avoid in all cosmetics and personal care products include ethylparaben, methylparaben, propylparaben and butylparaben. Many hand sanitizers contain about 65 percent ethyl alcohol, and like anything you apply to the skin, some of it is absorbed into your bloodstream. Research has found alcohol in the blood stream of people who have recently used hand sanitizers, and older kids have been known to get drunk from it by licking it off their hands or drinking from the bottle outright. Many hand sanitizers also contain isopropyl alcohol (rubbing alcohol) which is a petrochemical that’s a known neurotoxin. Isopropyl alchohol is also absorbed through the skin, and is toxic even in small doses. Alcohol can break down the protective outer layer of skin and allow chemicals to penetrate the skin easier, like those in the hand sanitizer itself, as well as chemicals such as BPA, which is found on cash register receipts. In a recent study, researchers found that people who held thermal receipts after using hand sanitizers absorbed up to 100 times more BPA than those who hadn’t used them. Alcohol-free sanitizers aren’t a safe substitute, either, because they typically contain triclosan and benzalkonium chloride, which has been linked to immune dysfunction, asthma and chronic dermatitis. The ingredients of the fragrances in cosmetics and personal care products are considered proprietary information and are virtually unregulated, so you have no way of knowing the chemicals that are going onto your skin. That said, many fragrances contain phthalates to make the fragrance last longer, which are known endocrine disrupters. According to the Environmental Working Group, fragrances have been linked with allergies, respiratory distress, dermatitis, and possible effects on the reproductive system. There really is no substitute for good old fashioned soap and water for killing the germs that cause diseases. For example, hand sanitizer won’t work against the stomach bug norovirus or the armored spores of C. difficile, a serious and sometimes life-threatening infection most often found in hospitals. So whenever you can, wash with regular soap (NOT the anti-bacterial type, which contains triclosan), and scrub your hands and fingers for two minutes. 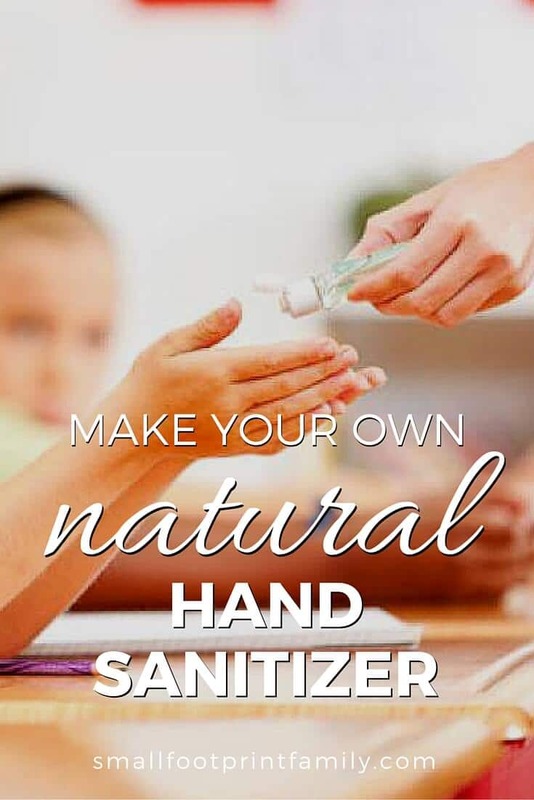 However, for those times when washing your hands just isn’t possible, this DIY hand sanitizer recipe won’t dry out your hands, or give you a dose of toxic chemicals. The ingredients in the average hand sanitizer are highly toxic, not only to germs, but to you. Here's why you want to ditch the store-bought stuff and use this DIY natural hand sanitizer recipe instead. In a small glass or ceramic bowl, mix essential oils with Vitamin E oil. Add the witch hazel to the oils and mix again. Add this mixture to the aloe vera gel and mix well. Pour the mixture into a couple of clean, dark 4-ounce bottles with pump caps. The sanitizer should last three or four months, since Vitamin E acts as a preservative. * In clinical studies, tea tree oil was found to kill most types of bacteria at a concentration of 0.5-1%. The concentration of tea tree oil in this recipe is 0.5%. If you adjust this recipe, be sure to keep the concentration of tea tree oil consistent so your recipe is effective. If you cannot get the 85% witch hazel, you might want to leave it out because other witch hazels are diluted with a lot of alcohol. I’m interesting in making this recipe but am rather confused by the different types of aloe vera gel, for example some can be a rather thick liquid as opposed to a gel. This looks to be rather expensive as 8 ounces is needed but the recipe only makes enough for a couple of 4 ounce bottles. Am in the UK so not sure whether we have a different product here. The consistency of 100% aloe should be somewhat gelatinous, like the inside of the plant when squeezed, but not super thick or viscous. Thank you Dawn, I shall go shopping!